OK, so it's curved, but what about 4K? The Samsung UE65H8000 looks great switched-off, it's loaded with apps and processing power, and it produces some decent images from all sources. However pleasant it is to operate and look at though, the 65-inch UE65H8000 seems overpriced for what ostensibly is 2013's tech dressed-up with a curve. Curved screens are a tactic I still find a little confusing since the 'more immersive' reasoning, for me, just doesn't hold up; in my field of vision a curved TV screen merely appears to curl-up in the corners. 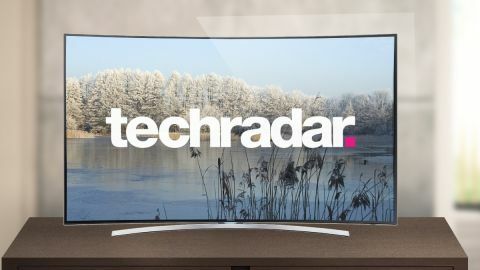 Forget 'why' though, the question you should be asking about this 65-inch flagship monster TV from Samsung's Series 8 is simple: would you pay £2,500 for a TV that wasn't sporting an Ultra HD 4K panel? With just a Full HD panel, the UE65H8000 is going to struggle to find a place on any AV nut's wish-list. In all other respects the UE65H8000 is a classic, range-topping high-end TV. It's got a Freeview HD tuner, a Freesat HD tuner, an app-laden Smart Hub, S Recommendation with voice interaction, Micro Dimming Ultimate picture processing, and a quad core plus processor. Looks-wise, the UE65H8000 is a player, too, with its smart metallic frame and metal stand likely to get a few wows from passing visitors. As well as being contoured, the slim (though the footprint of the curve is actually a chubby 107 mm) panel has a slim screen surround that's arguably more fashionable. Around the top and sides the black plastic surround measures a mere 5mm, with less than 0.5mm of blank, black screen before the picture begins. The bottom has another 5mm of frame plus a gap to a transparent rim, which is the output of the twin stereo 20W speakers. As with many Samsung TVs theres a spider-style stand, though this one can't be swivelled. That's a shame since the curve does cause some unwanted reflections that it would have been nice to move them out of view, though the dangers of moving something this big – and unusually shaped – are obvious. The UE65H8000 is laden with apps. A five-strong screen called Smart Hub adds various pages for downloadable games, on-demand movies, and digital TV, but it's the simple grid of apps that's the clear highlight. A top row includes the apps of four UK terrestrial broadcasters – BBC iPlayer, ITV Player, Demand Five and 4 on Demand – as well as Netflix, Amazon Instant Video and a few other space-fillers. Also included is the STV Player for those in Scotland and Spotify, YouTube, Facebook, Skype, Twitter, USA Today, VEVO, Vimeo, DailyMotion, TuneIn, euronews, Plex, Picture Box, UHD Zoo (no need to worry about that one on the Full HD UE65H8000) and BlinkBox. It's also got a new app called Samsung Smart Home in case you want to jump ahead into the Internet of Things era now to control your Samsung-made fridge, washing machine, robot cleaner and air conditioner from the UE65H8000. There's also a web browser and a camera app, despite there being no pop-up camera on the top of the UE65H8000. As expected, the UE65H8000 doesn't skimp on hardware, with two pairs of 3D active shutter glasses and two separate remote controls; one is a palm-sized 'smart' remote that is rounded, has braille-like buttons and a built-in microphone, motion sensor and touch pad. Along the bottom of a connections panel on the TV's right-hand side as you look at it are ins and outs for the TV tuners, a LAN slot (though Wi-Fi is also included), and component video and composite video inputs. Along the vertical are four HDMI slots, three USB slots, an optical digital output and a headphones jack. There's also an Evolution Kit slot for inserting 2015's software into. For a smaller take on the UE65H8000 head for the much cheaper, 55-inch UE55H8000, which is essentially the same, though has less of a problem with its Full HD resolution. For the curve and Ultra HD 4K action, opt for the 55-inch UE55HU8200, 55-inch UE55HU8500 or 65-inch UE65HU8500. If you're felling really flush, how about the 78-inch UE78HU8500, which sells for £6,499?